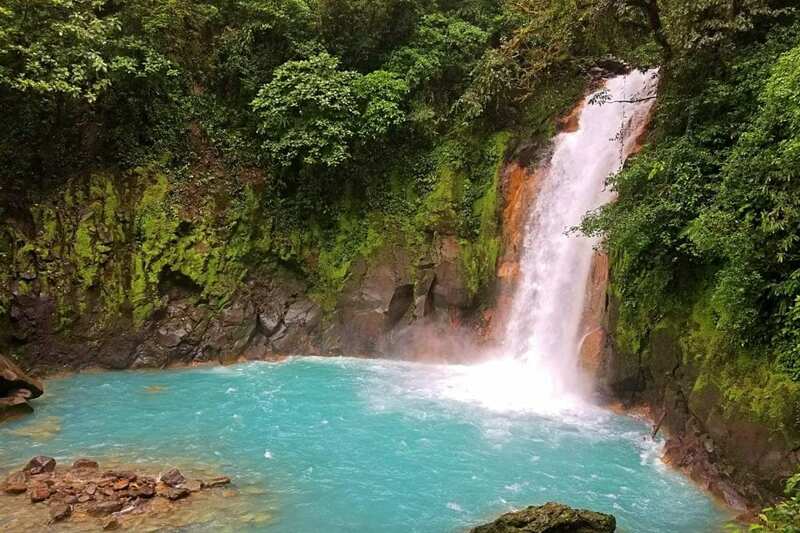 If you’re reading this, you probably know the Rio Celeste is a magnificent blue river in Tenorio Volcano National Park of Costa Rica featuring a huge waterfall plummeting into a blue pool below. There are a few things you need to know before you visit like – Do I need hiking boots? How muddy is it? How to make sure the water is its signature blue when you visit. 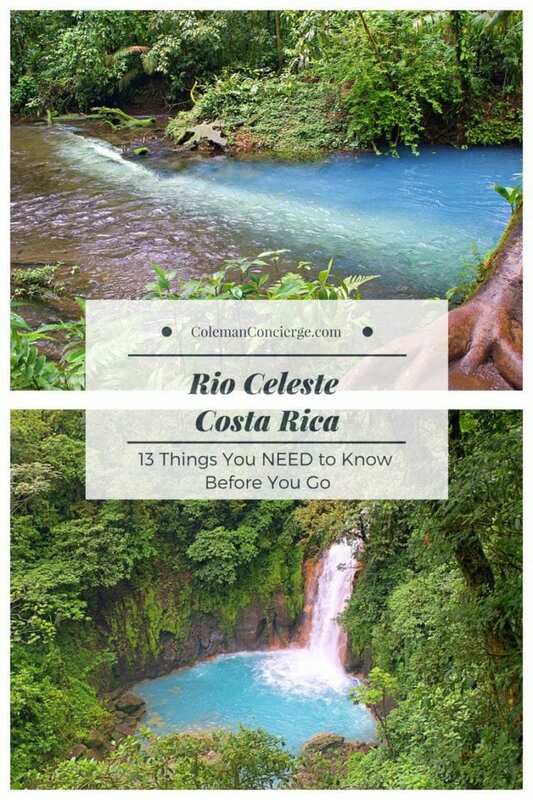 We compiled 13 things that you need to know before visit Rio Celeste. 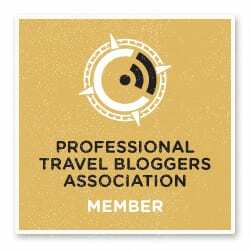 How do you get to Rio Celeste? 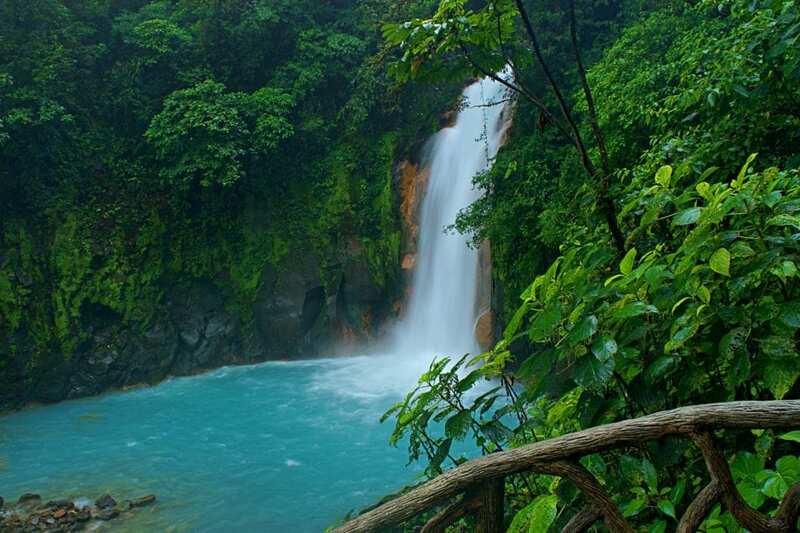 Rio Celeste is located about halfway between Liberia and La Fortuna in North Central Costa Rica. It’s about 1 1/2 hours to either town. 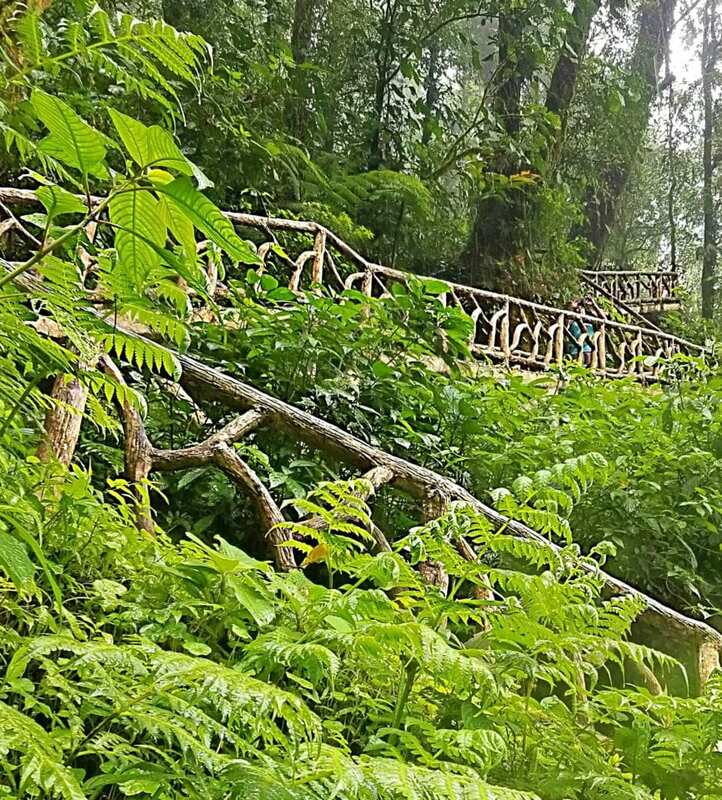 There is no bus service directly to Rio Celeste so you either have to have your own car ($5 parking), take a bus to Bijagua and taxi to the entrance ($30-40), or book a tour (~$115 including admission, guide, and lunch). How is the road to Rio Celeste? We went in February of 2018, and the road was paved all the way to the park. Those horror stories you might have heard about needing a 4x4 or high clearance vehicle are a thing of the past. Any car can make it to Rio Celeste with ease. 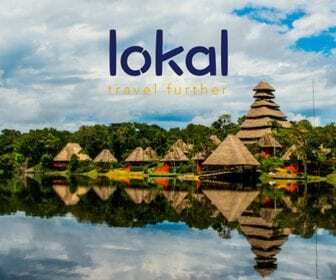 How much does it cost to enter Rio Celeste? 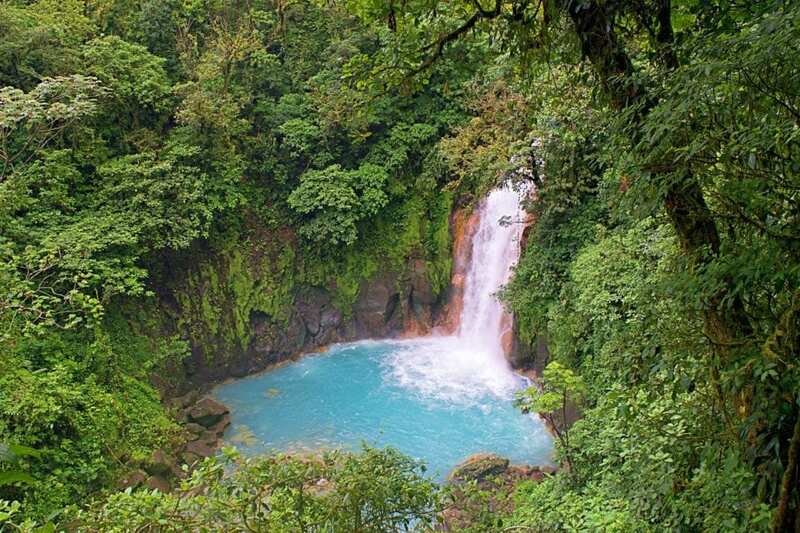 Entrance to Rio Celeste costs $12/ person and $5 to park. You will not need a guide for the hike but you might want to rent boots, but I’ll talk about that more in the mud section. The real cost to go to Rio Celeste is the transportation to get there. 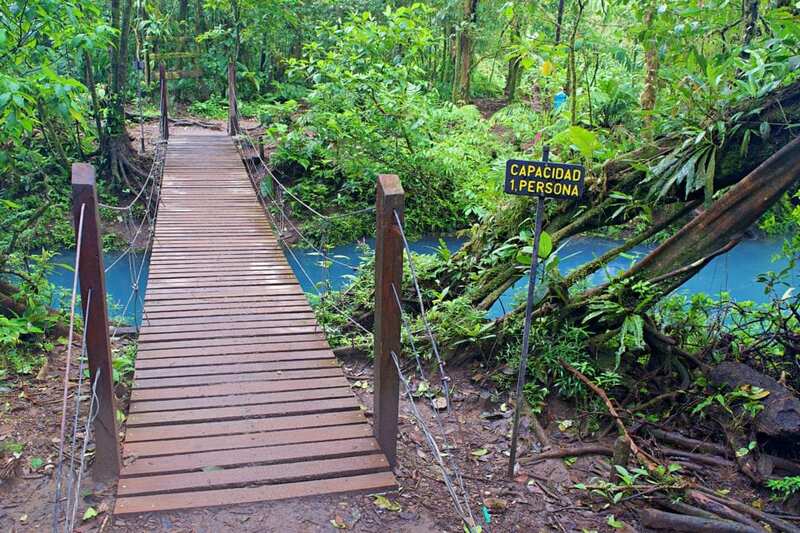 How muddy is the hike to Rio Celeste? In a word – mudderific. It was a mudtastophy. Yeah, pretty dang muddy. We went in early spring, and there was a reasonable amount of rain on the trip. I think the high season traffic causes a lot of mud to accumulate on the trail too. I would plan for mud and be pleasantly surprised if you found anything else. If your lodge has hiking sticks, you might bring one for the road, but I wouldn’t worry about bringing them to Costa Rica just for this hike. Renting boots from several vendors around the parking lot is possible. I went in my Chaco sandals, and it was kind of annoying. They were about done for after the hike, so I left them behind in the parking lot after I finished in case anyone wanted to salvage them. If you have a pair of boots that you are bringing anyway, that you are willing to get dirty, you should be ok. It is only $5 to rent boots, well worth not having to worry about footwear. 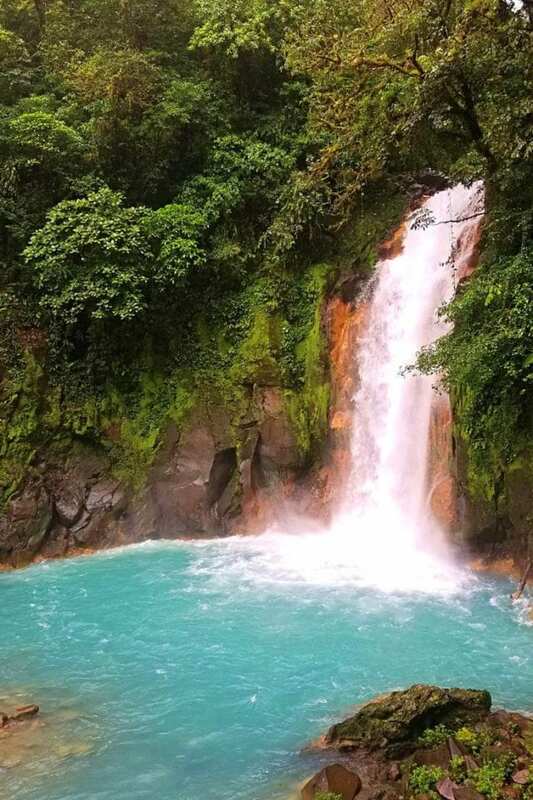 How far is the hike to Rio Celeste Waterfall? The waterfall is 1.5 km from the parking area. What’s more, this hike is relatively flat and even paved in sections. There is significantly less mud here than the trail past the falls. It’s about 150 m down to the waterfall or 327 steps. 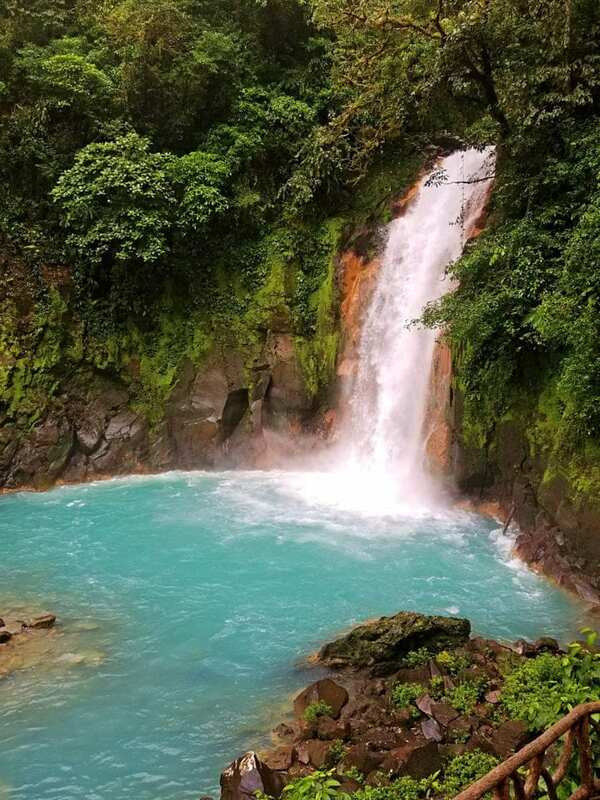 Is it worth hiking past the Rio Celeste waterfall? Maybe. We had people in our group hike past, and others stay behind. Everybody was happy with their decision. If you are doing ok with the mud, and feel ok after climbing up from the falls, definitely push on. If you really think you should turn back, then turn back. 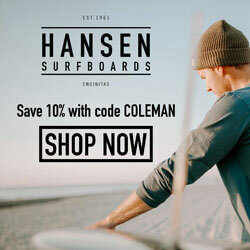 Let your body be your guide but know that there are some cool things to be seen. 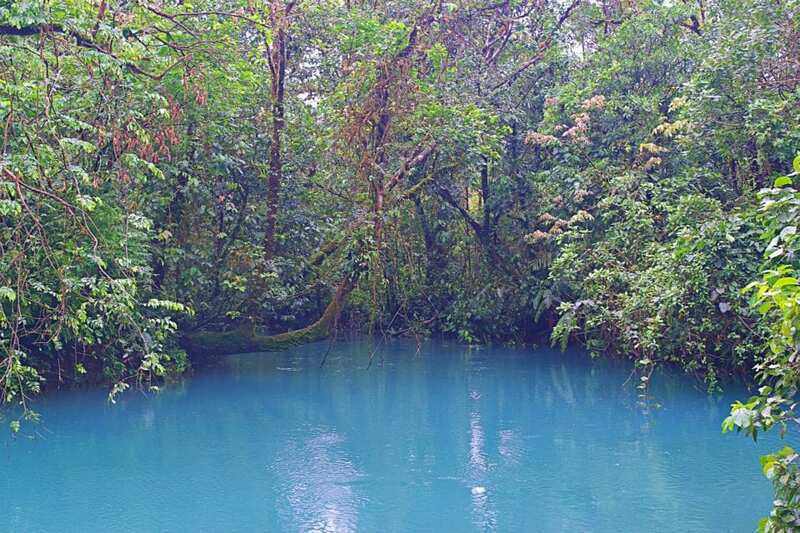 Why does the Rio Celeste look blue? 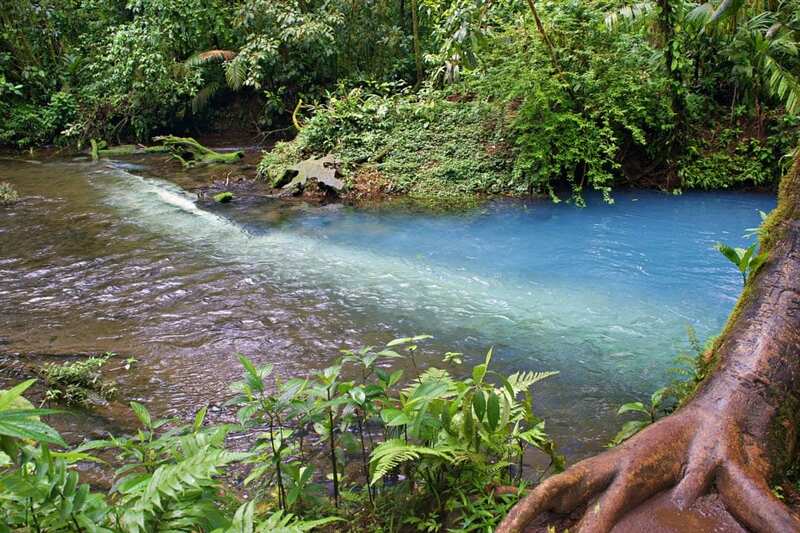 Folklore says Rio Celeste is blue because god dipped his paintbrush in the water when he was painting the sky. Science says it’s because of a high concentration of aluminosilicate particles with a small diameter in Buenavista River that aggregate when they reach the low ph of Sour Creek. The suspended particles produce Mie scattering which gives the river a beautiful turquoise color. Is Rio Celeste always blue? No, if there is fast moving water or mud in suspension, the river will no longer be blue. 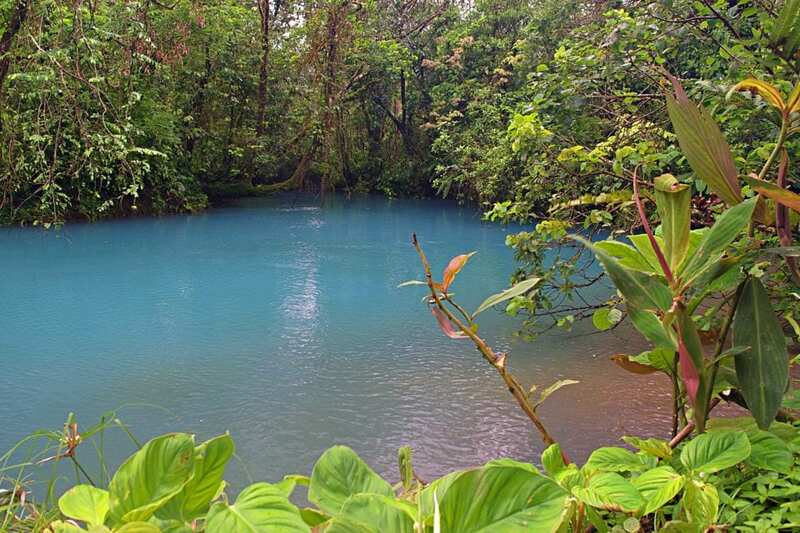 It’s worth checking a day or two ahead of time to make sure Rio Celeste is, in fact blue. 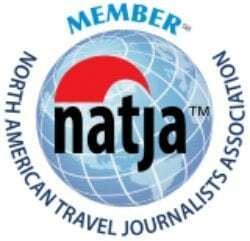 The good news is that this only happens a couple of days out of the year, so you’re probably going to be ok, but your tour guide or hotel concierge/host can double check for you. 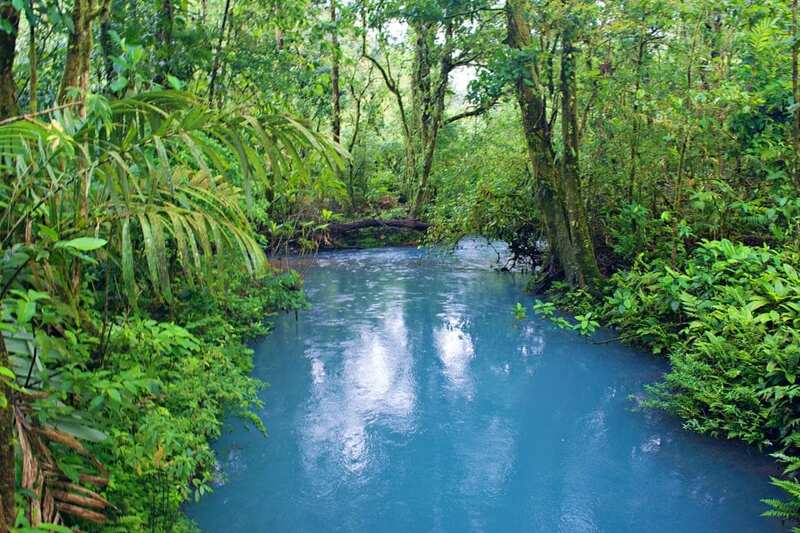 Can you swim in Rio Celeste? Yes and no. You can not swim or enter the water anywhere inside of Tenorio Volcano National Park. There were some fatalities caused by the hydraulics, and deep pool from the waterfall. That coupled with all the mud from all of the tourist’s boots would cause the water to lose its blue, and in essence lose its charm and allure. That said, there are no restrictions once the river leaves the park. There is a swimming hole by the bridge near Rio Celeste Hideaway Hotel or you can pay $6 per person at Piruri Cabinas to swim in the river. 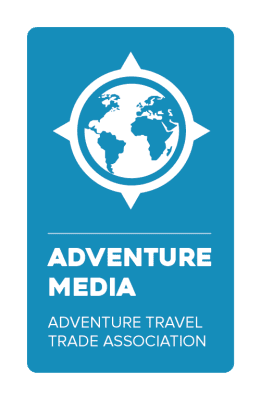 How long does it take to hike Rio Celeste? In total, it’s a 3.7 mile (6 km) round trip. Expect to spend about 3-5 hours depending on fitness and mud. In fact, go ahead and plan for 5 hours and be pleased if you get out a little early. What are the Tenorio Volcano National Park hours? The park opens at 8:00 and you need to be on the trail by 2:00. Come early because only 1,200 people are allowed in the park on any day and only 400 people at any time. It can get super crowded during the peak season in spring. 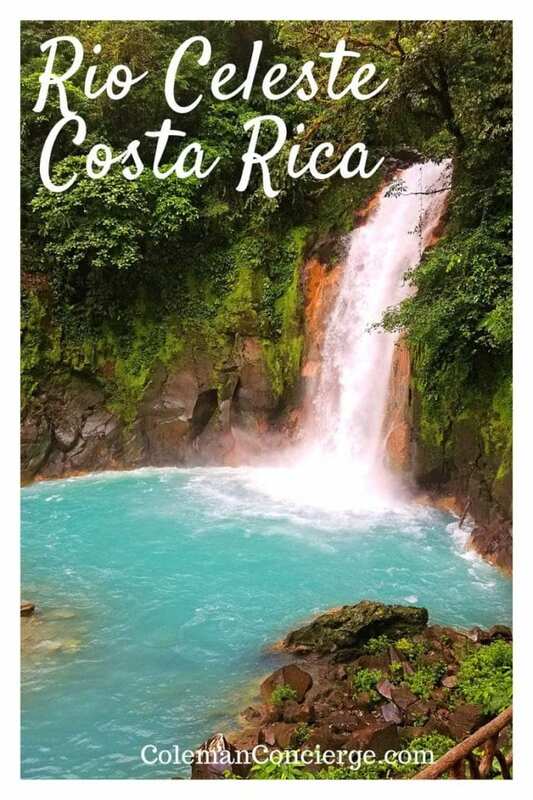 We went to Rio Celeste as part of our Costa Rica adventure trip. 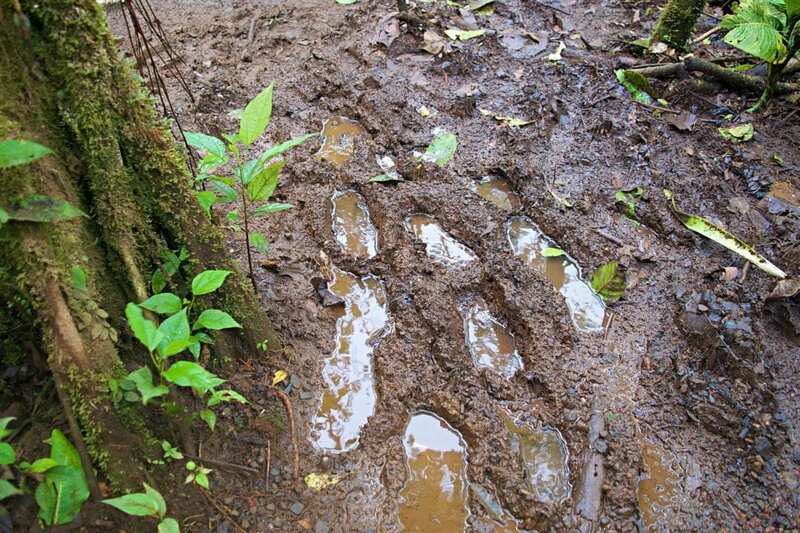 The jungle trail was a bit of a disappointment. It was wide, muddy, with a lot of downed trees. Any hint of disappointment vanished when we reached the falls. The main falls looked surprisingly similar to Havasu Falls, even though the blue in Havasu is from calcite. We were so happy that we pushed on to the end of the trial. Laguna Azul looked like something out of a fairy tale. I could not believe how suddenly the water turned blue at the confluence with Sour Creek. The more I looked, the more surreal it was – Pura Vida. I would strongly encourage everybody with a vehicle who likes nature to check this out. It’s well worth the $20 or so per person you will spend. 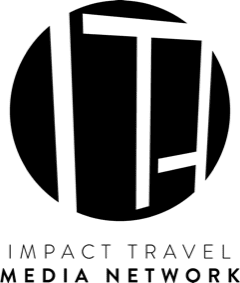 It’s a little out of the way, but you can tack it on to a trip between La Fortuna and Monteverde or Liberia. If you’re thinking about taking a guided tour at the $100+ price point, it might be worth it. 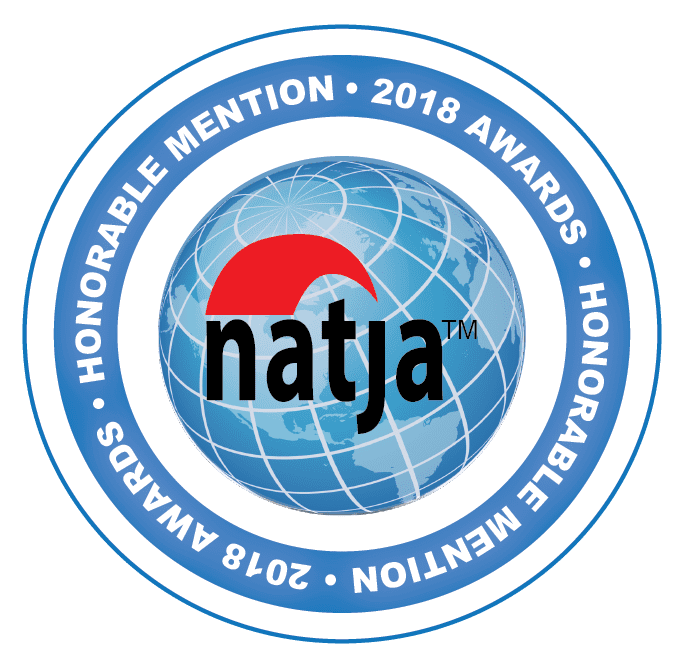 Rio Celeste gets a 4.5 star ranking on Tripadvisor because it’s a truly unique experience. When a park has to limit entrance to 1200 people at a time, it says something.